Isolated by a nation that feared him a security threat and considered undesirable by his President, whom thought him a needless political risk going into the Mid Term Elections, Patrick entered eternity without glancing upon his beloved children or holding the hand of the woman whom sowed tears the day she said “I Do” to him. All he desired was one last look, one last touch. Patrick was a conservative that wanted his home nation, Liberia, to extol the same freedoms and liberties that his new home nation, the United States, constitute. He desired that Liberia pursue the strategies of free markets that bring about personal property ownership, technological advances and cultural stability. He executed business on behalf of Liberia but sought the peace and freedom of the US. Yet, his old home defiled his good name and his new home silenced itself when he was in greatest need. 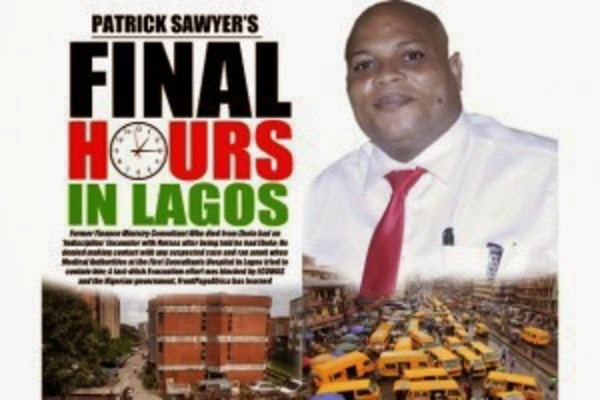 Cursed from Sovereign to Sovereign, Patrick Sawyer became the Poster for a Threat that President Barack Obama and his Administration were not prepared to handle: Ebola. Decontee, a Progressive, had come to a slow but subtle realization: “Obama was slow to respond”. She had voted for him and every part of her inner being knew that he would not disappoint. He had failed in other areas but, in this moment of life and death, he most certainly would defend. However, the most that she has received in terms of help from the White House is a letter offering condolences and pledging assistance. (The letter also included a voter registration form and donor form for Hillary Clinton 2016 but that’s to be expected. Laugh Out Loud! I digress). Since his untimely death, Decontee Sawyer has fought both nations’ leaders to obtain proofs of death and to ascertain the rightful subsidy to provide for her family’s needs. She has been unduly criticized by Liberians for speaking out and by Americans for not demanding more of the Administration. However, she perseveres and seeks to meet the needs of her children including, on that requires special services. Recently, it was reported that US Senator Al Franken met with her for three hours to assist her in obtaining Social Security Survivor Benefits.